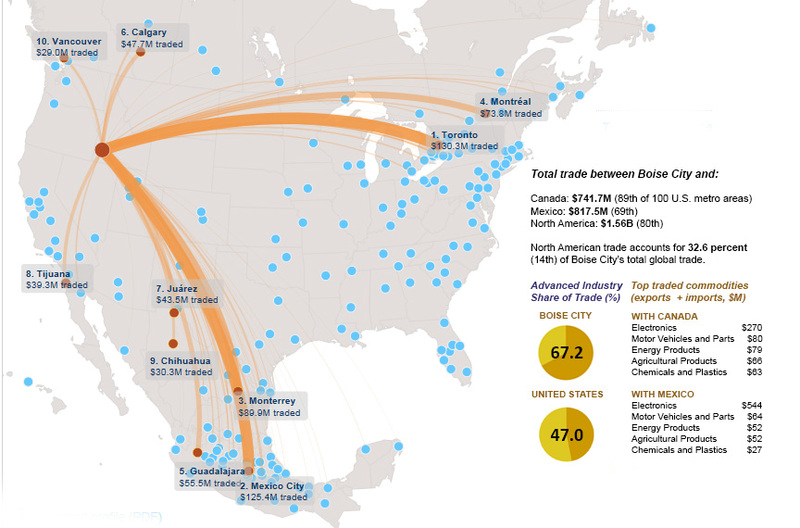 According to the research, metro Boise’s North American trade value was almost $1.6 billion in 2010. This was high enough to rank the area 80th among the 432 metro areas with populations of at least 100,000. By two other measures metropolitan Boise ranked even higher. The area ranked 14th in trade with Mexico or Canada at 33 percent of its global trade, and 11th in trade from advanced industries at 67 percent. Those measures underscore the importance and value of the area’s trade with our neighboring countries. The Toronto metropolitan was Boise’s top Canadian trade partner at $130 million followed by Montréal at $74 million. But trade with Mexico made up the bulk of the Boise area’s North American trade value – $818 million – with Mexico City its top partner at $125 million followed by Monterrey at $90 million. It is no surprise with high-tech giants like Micron Technology Inc. in the area that electronics made up the bulk of the value of goods going to both countries. Electronics accounted for $640 million of total trade value, dwarfing number two agricultural products at just $49 million. (1) Metro North America: Cities and Metros as Hubs of Advanced Industries and Integrated Goods Trade. This entry was posted in Employers and tagged Boise metro, Canada, idaho department of labor, idaho economy, Mexico, Micron, NAFTA, Trade on December 18, 2013 by Idaho Department of Labor.